Since I live in Memphis and Hot Springs is under 200 miles away, I started thinking several months ago about attending the ceremony to launch the Hot Springs National Park Quarter. I thought about it being the first issue of a whole new series so it would be a numismatically historic event. My employee Ernie and I left Little Rock about 6:15 AM for Hot Springs. Shortly after 7 AM a dozen workers were putting out chairs and bleachers and the police were out in force to direct traffic. Several local TV trucks were setting up. The ceremony could not have taken place on a more perfect day. It was sunny and warm but not hot. Park Rangers walked through the crowd passing out programs and souvenir fans. The ceremony took place in front of the Administration Building. The ornate façade around the building entrance and a bubbling hot fountain are depicted on the quarter. Bleachers and chairs were set up facing the building with the speaker podium being on the front steps. There was a special area just at the foot of the stairs for school children to sit and there were several hundred in attendance. The bleachers were mostly filled by 9:30. To the right of the main entrance the Hot Springs Community Band played. 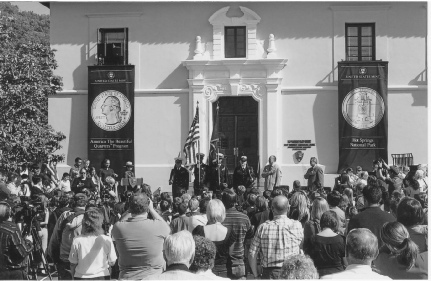 Around 10:00 there was a flurry of people running in and out of the main door as the US Mint Director and other dignitaries came out to be seated for the start of the ceremony. The Hot Springs High School Junior ROTC Color Guard marched out with the US and Arkansas Flags. We were ask to stand for the National Anthem. The Pledge of Allegiance was led by three local school children. A group of hearing impaired children attended the ceremony and their teacher stood before them translating into sign language. Josie Fernandez, Superintendent of Hot Springs National Park, was the Mistress of Ceremony. She was a tall thin lady in a crisp ranger uniform and hat who spoke with great pride as she thanked everyone for their attendance and gave us a brief history of the park. A letter from former President Bill Clinton was read by his step sister Kathy Farrar. Clinton had moved to Hot Springs at the age of 7 and in his letter he recounted some fond memories of the area and what the park had meant to him. Fernandez introduced her boss, Ernie Quintana, the Midwest Regional Director of the National Park Service. He thanked everyone for coming and said he was pleased to be a part of the ceremony. Mr. Moy spoke about the creation of the “America the Beautiful” series of quarters and how they were to honor the conservation of public lands for all the people to enjoy. He said that new lesson plans had been developed for teachers and were available free. They were designed, he said, to inspire students to learn more about conservation. He invited all Americans to come on this journey. He spoke about the design of the quarter. He spoke about the designer initials of JF on the obverse under the bust of Washington and said that while it was supposed to be for John Flanagan he joked with the Hot Springs Park Superintendent saying he knew it really stood for Josie Fernandez. She blushed, laughed and beamed with pride all at the same time. Mr. Moy then presented her with a Philadelphia and Denver mint Hot Springs quarter from the first day of striking March 4, 2010. As Ms Fernandez accepted the framed quarters she noted the irony that March 4th was the date in 1921 that the name of the park had been changed from Hot Springs Reservation to Hot Springs National Park. 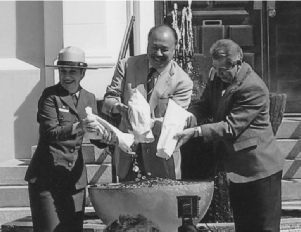 A fountain-like container was set up in front of the actual fountain and this was the site of the formal launch of the quarter. Moy, Fernandez and Quintana each were given a large bag of quarters. They simultaneously poured them into the container and announced the quarter as officially launched. 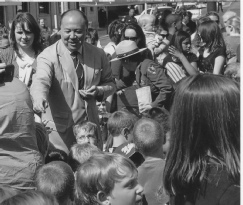 Following the ceremony Director Moy stepped into the crowd to give each child a free Hot Springs Quarter. He then had pictures taken with people, signed programs and fans and even some rolls of quarters. He politely declined to sign dollar bills. Immediately at the close of the ceremony, lines opened up for the quarter exchange. Many people had waited in the line for an hour before the ceremony started and during the ceremony to get their quarters. Each person could have 10 rolls or $100 worth of the new quarters. Once they started selling the quarters the line moved quickly. Bank of America had it well organized. There were three tents set up with 2 tellers (for lack of a better word) at each tent. The tables behind them stacked with quarters most already in bundles of ten with a rubber band around them. The armored car sat next to the tents along with several armed guards. As you approached you were directed to an available person to get your quarters. Person after person walked away with a bundle of 10 rolls. I saw one man with wife and 3 children in tow, walk away with a full box. Ernie and I each got our limit of quarters. Of course the next line was across the street at the post office where rolls were stamped and postmarked. I sent Ernie over to get the rolls stamped and I went back to see if I could get some more rolls since the exchange line was almost gone. At noon, the tents folded and the quarters moved across the street to the Bank of America. However, at the bank you could only get 5 rolls. When Ernie was in line getting the rolls stamped a photographer from one of the local papers took his photo and ask if she might use it in the next edition. Now that he is famous I hope he doesn’t ask for a raise!! Following the ceremony there was also a Hot Springs National Park Birthday cake, which I discovered when we were halfway back to Memphis. All in all it was a delightful day. If you have the chance to attend one of the ceremonies near you, I suggest you do. The Great Smokey Mountains National Park has been chosen for the Tennessee National Park. I know I am already looking forward to the Tennessee release day ceremony and it is several years away.